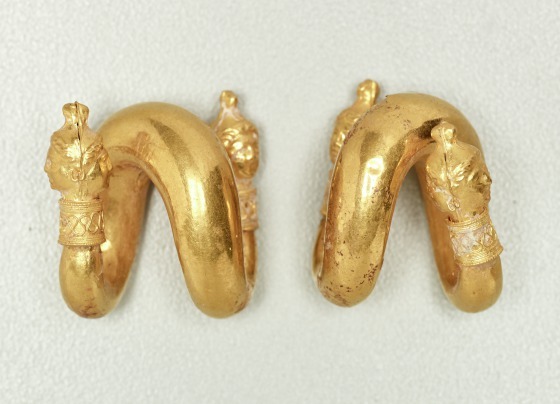 One of the most popular types of Archaic Greek ear ornaments, known from pictorial representations as well as from actual finds, is exemplified here by these ear spirals. Each earring is a hollow, omega-shaped spiral that tapers toward the upturned ends. 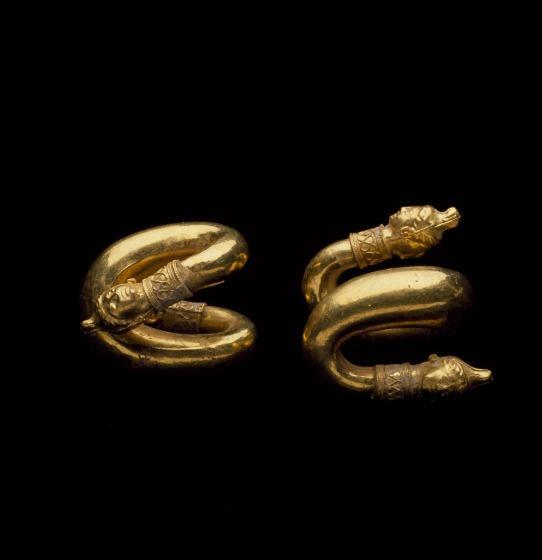 Attached to each end is a terminal in the shape of a double-faced head with female features, wearing a Phrygian cap and spiral earrings of exactly this type. The heads were worked in repoussé in two halves and then joined; the seams are still visible. The ornamental collars that join the plain spirals and the heads are decorated with an undulating wire framed by outer borders of plain and beaded wires. Spirals in general have a long history in Greek jewelry, with the first examples dating to the 9th century BCE. Their use as ear ornaments has been disputed, but representations on coins prove that even bulbous spirals like these were thrust through a hole in the earlobe. 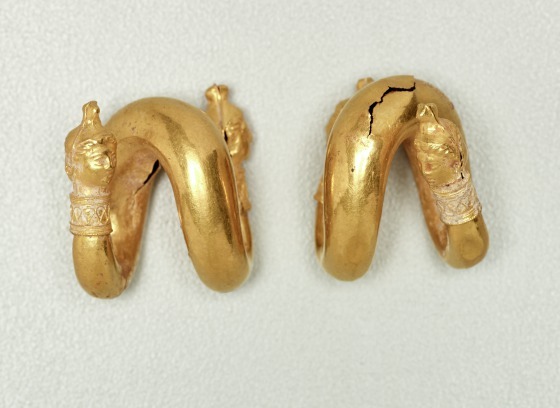 This example illustrates the development in Greek jewelry from comparatively simple shapes and discreet supplementary decoration (1991.75.40) to more elaborate forms and ornate designs.